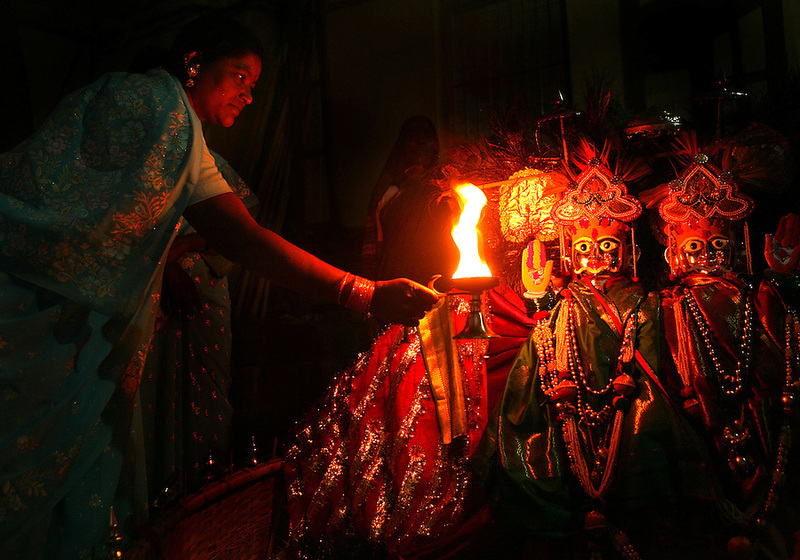 A Devadasi woman worships the goddess, Yellamma, at a temple in Maharashtra, India. The Devadasi tradition of which she is a product, involves the "marrying" of young girls from impoverished families to the goddess Yellamma. Oncea young girl is married to Yellamma, she is regarded as a servant to the goddess and must perfrom temple duties as well as satisfy the sexual needs of the priests and other men. She may no longer marry a mortal and may end up being sold by unscrupulous priests to pimps who will take her to work in the red-light districts of India's urban areas.